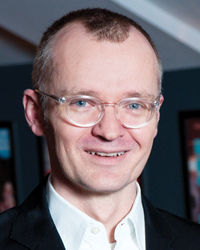 Darko Tresnjak ’88 has been named the fifth artistic director of Hartford Stage, a theater known for its production of original and classic shows for nearly 50 years. Renowned for his direction of theater and opera, Tresnjak has received awards from the San Diego Theatre Critics Circle for outstanding direction of Cyrano de Bergerac, The Winter’s Tale, and Pericles as well as an award for excellence in artistic direction. This year, he directed a national tour of The Merchant of Venice, featuring F. Murray Abraham as Shylock; and Titus Andronicus at the Stratford Shakespeare Festival. Tresnjak’s work has been seen at the Royal Shakespeare Company, The Old Globe, Los Angeles Opera, Joseph Papp Public Theatre, Oregon Shakespeare Festival, Chicago Shakespeare Theatre, Huntington Theatre Company, Theatre for a New Audience, and Williamstown Theatre Festival, among others.